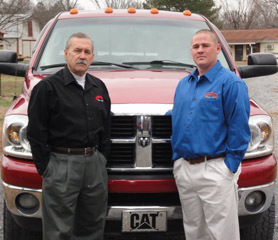 Castleman Drilling Company is a family owned and operated business, well into our fourth generation. We have been servicing the Middle Tennessee area since early 1900’s. We are a state licensed and fully insured company that can meet your drilling and service need with experienced technicians and exceptional service. Castleman Drilling is a full service company that can design your entire system. Our services include the drilling of the well, pump installation and repairs, installation of correctly sized pipe and wire, trenching lines for electrical and plumbing connections, and wiring systems for completion. Castleman Drilling also specializes in Geothermal Drilling and loop field design. We can complete the drilling, trenching, installation of loops, grouting, pipe fusion, headers and purging the unit for completion all without hiring any subcontractors. Please browse through our site at your convenience, and feel free to contact us if we can assist you in any way.